It’s the new year, 2017 has been and gone and what a roller-coaster ride that year was! 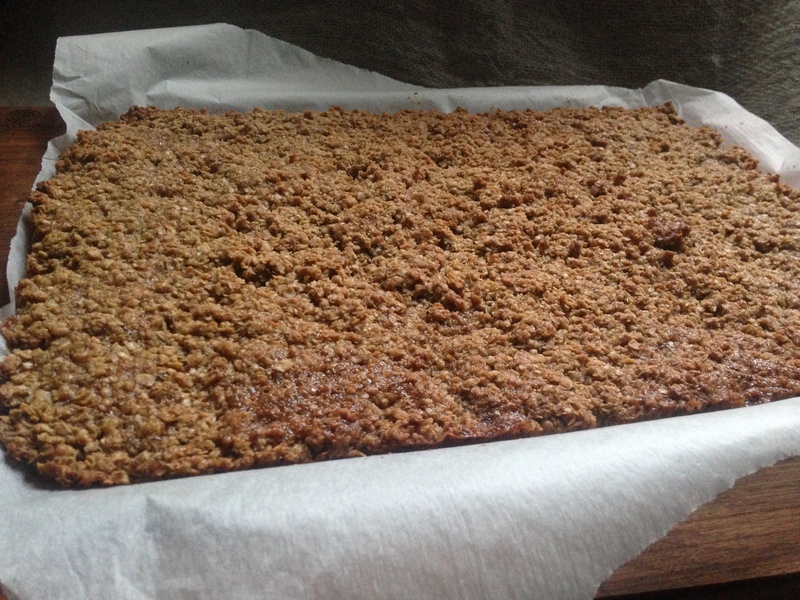 Today we are sharing our lovely spiced vegan & gluten-free flapjacks with you. Theoretically they were meant to be shared in the run up to Christmas as they are full of scrummy seasonal spice… but circumstances threw a spanner in the works as we had a very rubbish hospital appointment just before Chrimbo. It took a while for us both to recover, but we have – as always. Aars is on steroid treatment for a few months and then at the very end of Feb will have another op to see if the steroids have healed up some of the damage the disease has done. Over the Christmas hols a lot of baking and eating of comforting tasty treats like these flapjacks was done, but little online activity accompanied it. So I am catching up! These flapjacks are great as they take about 20 minutes from start to finish. If you like chewier flapjacks just leave them in the oven a little longer, and if you prefer them softer take them out earlier. We know that 13 minutes in our fan oven is perfect for us, but every oven and every one is different! These flapjacks are not just special thanks to the spices. They also have flaked quinoa in the mix too – which makes them tasty nutty, whilst being 100% nut-free. The quinoa also makes them a little denser. I love the nuttiness of the quinoa, but Aars prefers his flapjacks made with 100% gluten-free oats. As he has developed quite a big intolerance (but not anaphylaxis) to corn/maize since being gluten-free I am trying to mix it up, and not become too heavily reliant on gluten-free oats. Sadly he’s less keen than me on this mix! Our family and friends loved them, when they came over and they make pretty tasty Christmas pressies too! We decorated ours with edible stars for Christmas. It’s nice to be back! Here’s hoping that 2018 will be gentler and kinder to all of us! 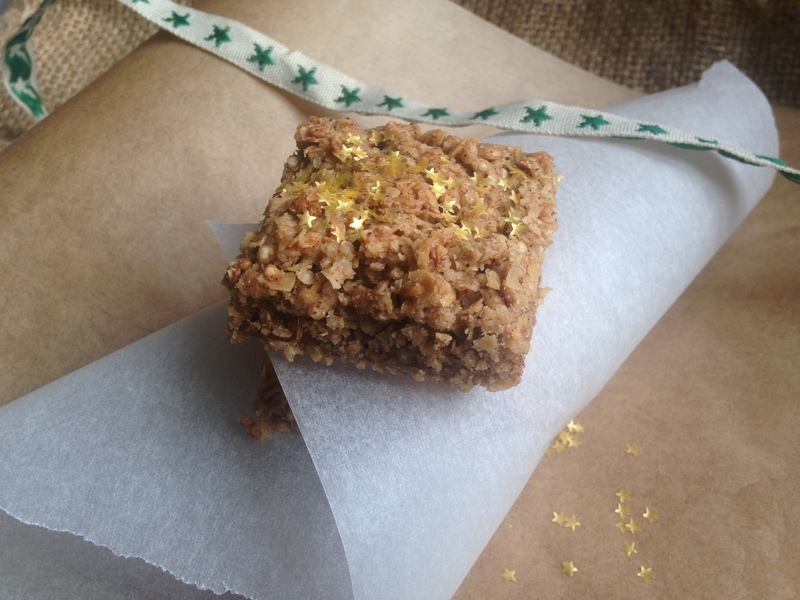 Rammed full of fabulous flavoursome Christmas spices these flapjacks super simple to make. Preheat the oven to 180°C (fan) and prepare a baking tray with baking paper. In a heavy based pan add the fat, sugar, syrup and spices and heat up slowly until the fat has melted and the sugar dissolved. Take off the heat and stir in the gluten-free oats and quinoa mix. Pour the lot onto your baking tray and spread the mix out so that it's even. Pop into the oven for 13 minutes. Once it comes out of the oven leave to cool for 5 minutes, then slide onto a chopping board and cut into squares.